Cozy, Romantic, Secluded 1,400 square-foot, log cabin located one mile from Downtown Steamboat Springs. Bordering national forest lands, you do not have any visible neighbors--just beautiful woods all around you with a bubbling creek right outside your door. In the summer hiking and biking trails can be accessed just feet away and in the winter the same trails turn into a cross county skiing and snowshoeing paradise. Cabin is two stories high including a full size kitchen with a wrap-around deck over looking your own private creek. The Cabin is also equipped with a full size bath room and full size washer and dryer. On the main floor there is a cozy living area for watching movies, reading books, sleeping on the queen size sofa bed or just sitting by the wood burning stove. Tv provided does not have tv reception, but will play DVD's and VCR's. High speed internet available for your computer for work or play. The main sleeping area is located on the second floor where there are two bedrooms. One bedroom with four single beds and a separate loft room with a queen size bed. Open the windows in either room and you can hear the water from the creek down below. The best sleeping pill, ever! Kids and adults love the rustic beauty of this hand built log cabin on a live stream. Do not miss your opportunity to enjoy some of the greatest skiing in the world at Steamboat Ski Resort which is located only a few miles away. Or drive up the road and play at Howelson Ski Area, located right downtown. This cabin is close to ample shopping and many great local restaurants. Do not miss your chance to book one of Steamboat's most private and unique Log Cabins. This rustic little jewel can be your 'little bit of heaven' in summer or in winter. Contact us today! This cabin is immediately adjacent to Spring Creek. You can fish from the deck! Propane baseboard heat. Supplemental wood stove for ambiance. Look no further! This cabin that lets you feel like you're far away from it all but is close enough to walk downtown. My wife and I enjoyed a long weekend in Steamboat and this cabin was the absolute perfect place for us to stay. We had everything we needed inside the cabin. We had everything we need outside the cabin within walking distance. The owner is very friendly and easy to work with. We would stay here again without hesitation! Stephanie’s cabin was absolutely perfect. A group of friends and I wanted a mini getaway from Denver, and we found exactly what we were looking for. The cabin itself is super cozy and comfortable, with a perfect wood stove and ambiance. The proximity of the cabin to the Spring Creek Trail was great for an afternoon hike. Downtown Steamboat is only a mile or so away, and Strawberry hot springs was a short drive! Absolutely looking forward to staying here again! Stop looking and book this cabin right now! This cabin is a piece of heaven! It is so cozy and comfortable and wonderfully located. Everything we needed was provided. The cabin is less than a mile from the main drag and yet it is completely rural and privately located. We watched a momma moose and her little walk right along the street in front of the house. We will definitely be staying here when we return to Steamboat Springs. We absolutely loved our time at the Spring Creek Cabin! We really enjoyed only being a mile from downtown, yet being so secluded and tucked back next to the national forest. The cabin had plenty of space for our family and dogs, and we really felt like we were at home. The owners have taken incredible care of it and it is so well maintained! Being able to just walk out the front door to a beautiful hiking trail was incredible! This truly was the most perfect getaway and we are definitely booking again for next year! What a great cabin. Has everything you need and is close to town. Loved, loved, loved our stay there. Would love to book it in the summer time (we were there in February - lots of snow!) when we could sit out on the deck and enjoy the creek! Next time! Very cozy and comfortable. Thanks for sharing! Great guests! Please do come back . Summer on the deck by the creek is amazing! Check the calendar!! Summer books fast! My husband, son, his girlfriend and I stayed in Stephanie's cabin in celebration of my son's successful Phd defense. Cabin is roughly 3 hours or so from Boulder (give or take) depending on traffic. We all just needed to relax, and relax we did. Cabin is clean as a whistle, cozy and toasty warm. We kept the stove stoked all weekend and I spent much of Saturday nodding off in front of the flames watching the snow fall gently outside. Stephanie has thought of EVERYTHING. The cabin kitchen was better stocked than my house. After a pit stop at the local grocery store, we made all our meals in the cabin. There is a lovely hiking trail near the cabin (but not too close so there aren't any looky-loos). The guys went snowboarding and fat tire biking and had a blast. My favorite part was our night time visit to Strawberry Park Hot Springs in the dark--so relaxing. I'm getting goose pimples just thinking about it now. This was a trip of a lifetime that I will remember always. We are trying to figure out how quickly we can return. One of my tippy top vacations- highly recommended! So glad you enjoyed your time at the cabin! 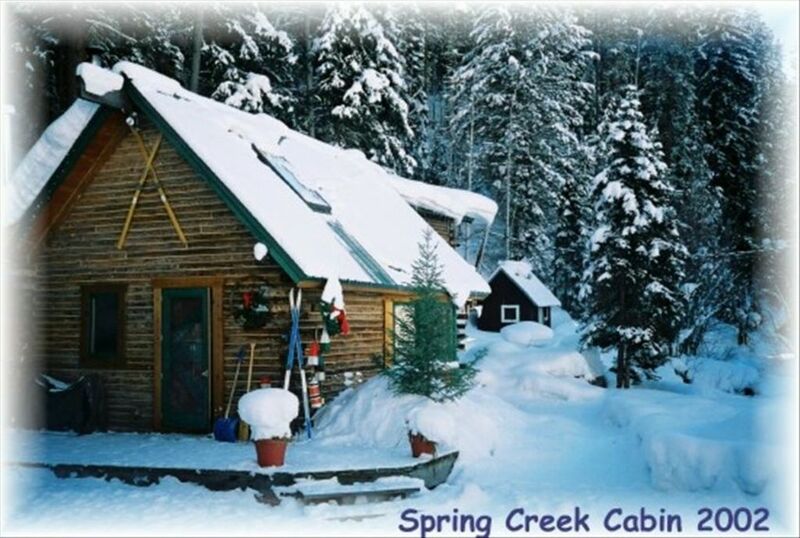 It is a great little rustic getaway and we hope great guests like you will return to enjoy the charms of Spring Creek Cabin for many years to come..visit us in summer too when the creek is roaring . Thank you for taking the time to review. A credit card is required on file as a damage deposit. Nothing is charged unless there are damages or excessive cleaning. A full refund is provided if the property can be re rented for the time that you have booked. With enough advance I have always rerented.